There is no shortage of Pennsylvania DUI Attorneys. If you open the local phone book or search the net you will find thousands. Obviously, not all of them are equal and if you investigate, you will be able to separate the truly excellent ones from the rest. This series is a guide to give you important information on how to find the best DUI Attorney in PA? In order to help those citizens in Pennsylvania facing a DUI, we will highlight what you should look for when searching for The Best DUI Attorney in PA.
As mentioned before, there is a lot of scientific evidence in a DUI case. In a theft case, the central piece of evidence is normally the stolen property. In a drug possession case, it is the amount of illicit drugs. These are tangible pieces of evidence that can be seen and verified quite easily. In a DUI case, the prosecution will introduce a piece of paper that has your BAC written on it. That number should be based on the amount of alcohol in your system. This is intangible because it is not something that can be seen and examined with the naked eye. There are very specific scientific procedures that need to be followed to arrive at this number and if the sample is mishandled or the machinery inaccurate, it can artificially skew the results. Defending DUI cases requires a detailed understanding of the chemical processes in your body, the laboratory procedures used to test your sample and of the equipment used in breath testing and blood testing, amongst many other areas. 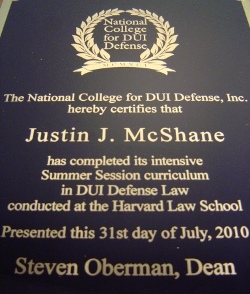 This is why continuing education in the form of advanced DUI training is so important for a DUI attorney. I am committed to offering the best DUI defense in Pennsylvania and I have a DUI training résumé that is unparalleled in PA. Gather your information and investigate the training level of the attorneys you are considering because this is very important. The knowledge gained through these DUI seminars is vital and maybe the difference between a guilty and a not guilty verdict.